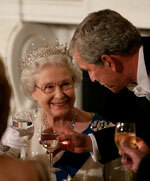 Spoof news: Cost of monarchy rises after Queen Elizabeth goes on bingo and cider binge! Cost of monarchy rises after Queen Elizabeth goes on bingo and cider binge! Royal watchers have blamed the Queen for a 100% increase in the cost of subsiding the monarchy. Every year, the tax payer contributes a whopping half a million pounds towards the Royal Family (who gets their remaining several million pounds from investments and rent). However, last year, the cost rose to one million pounds. That's the annual cost of 500 policemen, 750 firemen, 1,000 nurses or half a banker. While it may be true that the Monarchy brings in several hundred million pounds from abroad per year, mainly tourism but also investments, that's just shifting dosh, isn't it? Insiders claim that the Queen has been going on bingo benders with some of her old age friends from London.
. "She brought a smelly old man with her who must have been the Duke of Edinburgh", the short-sighted shopkeeper added. A spokesman for the Palace said "WTF are you talking about?"